Azamara Quest will receive a variety of exciting enhancements this spring. Scheduled to be in dry dock in March, Azamara Quest will receive major upgrades – from the addition of a new lounge “The Den” – to stateroom renovations and new shopping options. In addition, six new Oceanview Staterooms are debuting on deck 4. 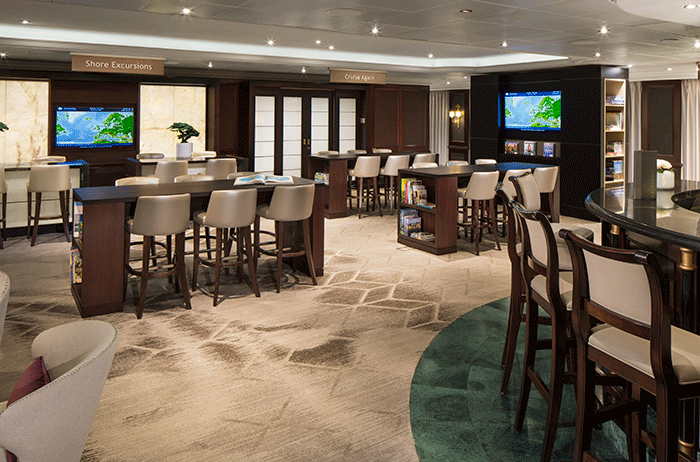 The guest-favorite lounge from the Azamara Pursuit is making its way to the Azamara Quest. The Den will replace the Casino area on Deck 5, featuring live music in the evenings and drinks from the neighboring full bar, Spirits. The Den will also be the new home to the Shore Excursions and Cruise Again desks. The shopping venues will be completely renovated and restocked with a number of stylish new brands. Finding the perfect gift on board just got easier than ever before. There are more chances to enjoy spectacular ocean view with the addition of six new portside Oceanview Staterooms, debuting on Deck 4. Paying attention to comfort and style, the Specialty Restaurants and the Club World Owner’s and Club Ocean suite balconies have received new furniture. Standard stateroom shower walls have been renovated and new carpets have been added in all corridors. Azamara Quest will debut her new look and style on a 16-night Thailand and Vietnam voyage, departing on March 29, 2019. Azamara Quest, ship refurbishments. Bookmark.